CBM49 modules are found appended to plant GH9 endoglucanases, and are described as unique to plants <cite>Urbanowicz2007</cite> though [http://www.cazy.org/CBM49_all.html CAZy] has also classified proteins from Amoebozoa into the CBM49 family. The three members of plant [[Glycoside_Hydrolase_Family_9/Plant_endoglucanases|GH9 class C]] have not been well studied in ''Arabidopsis'', however, the tomato and rice orthologs of At1g64390 (AtGH9C2) have been examined. For example, Urbanowicz et al. provided evidence for the binding of the tomato SlCel9C1 CBM to crystalline cellulose, as well as hydrolysis of artificial cellulosic polymers and a variety of plant cell wall polysaccharides by the catalytic domain <cite>Urbanowicz2007a</cite>. A similar study was performed on the orthologous rice endoglucanase by Yoshida and Komae , further confirming that the catalytic domain is capable of hydrolyzing a suite of polysaccharides <cite>Yoshida2006b</cite>. There is also evidence that the rice CBM49 (previously called a CBM2) is post-translationally cleaved from a 67 kDa form to 51 kDa endoglucanase isoforms <cite>Yoshida2006a</cite>. The authors suggest this may play a role in establishment of lateral root primordia from differentiated pericycle cells as the CBM likely facilitates the hydrolysis of crystalline cellulose <cite>Yoshida2006a</cite>. Thus, the uncleaved enzyme could participate in the removal of secondary walls from the pericycle cells which contain crystalline and insoluble polymers <cite>Yoshida2006a</cite>. The authors also suggest another alternative, that the full-length enzyme may be inactive until it reaches its target in the cell wall, where it is then cleaved by proteolysis so that the catalytic domain is 'activated' in proximity to the substrate <cite>Yoshida2006a</cite>. Glass et al. have shown that over-expression of poplar PtGH9C2 in ''Arabidopsis'', together with down-regulation of ''Arabidopsis'' AtGH9C2 using RNAi, results in plants with modified degrees of cell wall crystallinity, which was inversely correlated with changes in plant height and rosette diameter <cite>Glass2015</cite>. Thus, over-expression of PtGH9C2 resulted in a decrease in height and rosette diameter and an increase in cell wall crystallinity <cite>Glass2015</cite>. Whereas downregulating AtGH9C2 increased height and rosette diameter and decreased cell wall crystallinity <cite>Glass2015</cite>. 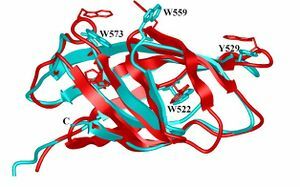 The authors suggest that genetic modification of PtGH9C2 and AtGH9C2 expression levels ''in planta'' indicate that their CBM49s function to target the GH9 enzymes to crystalline cellulose prior to proteolytic cleavage, thereby regulating cross-linking with hemicellulosic polysaccharides, preserving the crystallinity of the newly synthesized cellulose microfibrils and limiting cell expansion <cite>Glass2015, Fujita2011, Lai-Kee-Him2002, McQueen-Mason1995</cite>.